Version of Benetl, the free ETL tool, in download is version 4.9.1. You should update. A version for Linux is available. This release is a mature one, you can use in a production mode. Please read about "part formula" and "interesting example" in documentation, in order to see possibilites that Benetl brings. 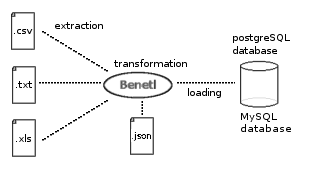 MySQL users, please read about "Benetl core configuration" in documentation. Benetl is a freeware you can freely download, use and redistribute.